It's Michelle~ I know I've been MIA for quite a while. May was one hell of a month. Lots of things happened that prevented me from blogging, so that's why I was MIA. Last week was my birthday week/recovery from May week, so I took the time off to just celebrate and relax. However, I am back now and I'm ready to share with you all the products I've been testing. These here are the Bonvivant Illuminator Age Cover Masks. The line comes with 3 choices: Pearl, Gold, and Diamond. I was quite excited about these masks because there has been some chatter about them. Mainly because the sheet masks supposedly really sticks onto your skin like a glove and I wanted test that theory. Plus, as a mask lover, I'm generally excited to try (almost) every mask. Anyways, let's get to know them! Before getting to know the masks, I'm going to share the packaging, texture, color, and scent of them here since they are all pretty much the same. I usually share these parts under each product, however, since these masks have similar packaging style, mask texture, scent, and color I didn't want to sound repetitive throughout the review. 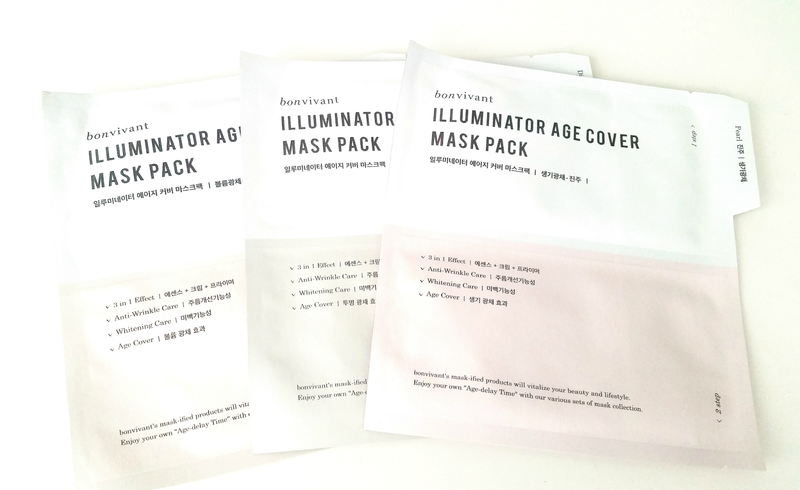 Packaging: The sheet masks all come in 2 sections, Step 1 & Step 2. Step 1 contains the top part of the mask while Step 2 contains the bottom part of the mask. I like that the 2 parts are stored separately because it makes application easy and you don't have to worry about where to put 1 part while you are trying to apply the other. The masks comes with a mesh protective layer as well. On the back of the mask package, you can find the full ingredient list in English. The rest of the information on the mask are pretty much all in Korean and I wish it has more English information on it. Scent: All of the masks have this floral (soap-like) perfume scent to it. Fragrance is added to the masks as well. Color: The mask sheets are white in color while the serums are milky. Texture: The nano fiber sheet masks feels a bit thicker and plusher than other sheet masks. The mask serums are on the thicker side as well and have a milky feeling to it. The only mask serum that was a bit different than the rest was the Diamond mask. Its serum is not as thick as the other 2 but still milky in color. To compare, all 3 masks' serums are thicker than MBD's mask essences and the Diamond one reminds me slightly of the Innisfree Black Berry masks. Product Description: Sheet masks made with nano fibers that will deify gravity within 10 minutes and stick to the skin like a glove. Each mask is made with 700 nano fibers, which allows for better absorption of the mask serum. The sheet masks also contains 50% hydrating age deifying serum which will leave your skin dewy and supple. The Pearl masks contains pearl extract that will revitalize and energize dull skin, giving it a youthful look. To Use: Cleanse and tone the skin first. Take out step 1 of the mask, which is the top piece, and apply it onto the skin. Take out step 2 of the mask, which is the bottom piece, and apply it onto the face. Leave them on for 10 to 20 minutes, then remove. Pat in any remaining serum and continue on with the rest of your skincare routine. 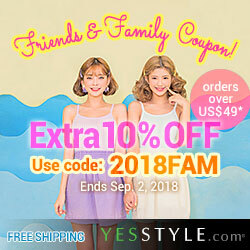 Ingredients: Water, Methylpropanediol, Glycerin, Caprylic/Capric Triglyceride, Niacinamide, Dimethicone, Butylene Glycol, Opuntia Ficus-Indica Stem Extract, Eucalyptus Globulus Leaf Extract, Adansonia Digitata Seed Extract, Selaginella Lepidophylla Extract, Adenium Obesum Leaf Extract, Beta-Glucan, Pearl Extract (0.1 ppb), Rosa Canina Flower Oil, Ceramide NP, Squalene, Oryzanol, Fructan, Sodium Hyaluronate, Trehalose, Allantoin, Adenosine, Glyceryl Stearate, Polysorbate 60, Sorbitan Sesquioleate, Polymethylsilsesquioxane, Silica, Polysorbate 20, Xanthan Gum, Carbomer, Tromethamine , Synthetic Fluorphlogopite, Tin Oxide, Titanium Dioxide, Cetearyl Alcohol, Disodium EDTA, Ethylhexylglycerin, 1,2-Hexanediol, Phenoxyethanol, Fragrance. Michelle's Thoughts: I looked at the ingredients of all 3 types of masks before trying them and I noticed something interesting. All 3 masks have the exact same ingredient list with the only exception being the pearl or gold or diamond extract. (I'll highlight that in the ingredient lists.) Usually, when masks have the same ingredients in the exact same order except 1 they pretty much perform the same. So, I was a bit disappointed by that because I had thought the 3 masks would offer different skincare benefits, not the same. Anyways, the Pearl masks were the first ones I tried. I got 2 of these, so I tested them both out between 3 days time. The first thing I noticed was that true to its claim, the sheet mask really sticks to your face after 10 minutes. It actually didn't even take 10 minutes, I think after 5 minutes the mask was already clinging on my face. I even did jumping jacks and they didn't slide 1 bit. That's a really nice bonus as I could move around and do stuff with these masks on. It's not always the same with other masks I have. Skincare benefits wise, I did notice a bit of dewyness to my skin after I used the sheet masks. My skin did feel supple and soft. Plus, it was also moisturized as well. The mask had thicker serum, so it lasted well over the 10 to 20 minutes mark the instructions had suggested. While it was still full of serum at the 35 minutes mark, I decided to take off my mask then anyways. In my experience, sheet mask with milky serums can leave white looking serum residues if you let the masks dry almost completely before removing. However, if you remove them before the mask dries, you won't run into that issue. I've noticed that I can't use this mask when my skin is super sensitive. On a normal day, nothing would happen but when my skin is super sensitive, these sheet masks can cause a tingly sensation. While it didn't break me out of anything, it did feel slightly unpleasant. So, the lesson here is that this mask might not be great for those with super sensitive skin. Product Description: Formulated with 24k gold extract, these Bonvivant Illuminator Age Cover Gold Masks can provide a radiant and opulent glow while moisturizing the skin. The masks are made with nano fiber that really sticks well to the skin and helps with absorption. The sheet mask serum contains Ceramide to help strengthen skin barrier, Fructan to provide hydration, Rose Hip Oil which is rich in vitamin C to provide vitality to the skin, and SC Glucan which protects the skin from environmental damages. It's suggested to be great for blemishs and dull skin types. To Use: Cleanse and tone the skin first. Apply part 1 and part 2. Leave it on for 10 to 20 minutes then remove. Continue with the rest of the skincare routine. Ingredients: Water, Methylpropanediol, Glycerin, Caprylic/Capric Triglyceride, Niacinamide, Dimethicone, Butylene Glycol, Opuntia Ficus-Indica Stem Extract, Eucalyptus Globulus Leaf Extract, Adansonia Digitata Seed Extract, Selaginella Lepidophylla Extract, Adenium Obesum Leaf Extract, Beta-Glucan, Gold (0.1 ppb), Rosa Canina Flower Oil, Ceramide NP, Squalene, Oryzanol, Fructan, Sodium Hyaluronate, Trehalose, Allantoin, Adenosine, Glyceryl Stearate, Polysorbate 60, Sorbitan Sesquioleate, Polymethylsilsesquioxane, Silica, Polysorbate 20, Xanthan Gum, Carbomer, Tromethamine , Synthetic Fluorphlogopite, Tin Oxide, Titanium Dioxide, Cetearyl Alcohol, Disodium EDTA, Ethylhexylglycerin, 1,2-Hexanediol, Phenoxyethanol, Fragrance. Michelle's Thoughts: The Gold masks were the second ones I tried out of the 6. After trying the Pearl ones and knowing that these share the the same ingredients as the Pearl ones, I already knew what to expect. Sure enough, there were no surprises. These masks have the same skincare benefits as the Pearl ones. Which means that my skin felt supple and soft after each use. There was a bit of a glow to my skin and the mask felt moisturizing as well. I didn't feel that ultra-hydration the product promised (just normal hydration) and while the mask claims that it's great for blemishes, it didn't make a difference to the few I had. (So, it made claims that it can't fulfill.) I think this was the most disappointing mask for me out of the 3. Product Description: Sheet masks created with revolutionary technology that will firm, illuminate, and deify gravity all in 10 minutes. The masks are created with nano fibers which can stick nicely to the skin without budging and helps with absorption. The mask serum is formulated with various extracts to moisturize, firm, and illuminate the skin. Creating brightened, smooth, and soft skin with a radiant glow. To Use: Cleanse and tone the face first. Apply part 1 and part 2 of the mask. Leave it on for 10 to 20 minutes then remove. Continue on with the rest of the skincare routine. Ingredients: Water, Methylpropanediol, Glycerin, Caprylic/Capric Triglyceride, Niacinamide, Dimethicone, Butylene Glycol, Opuntia Ficus-Indica Stem Extract, Eucalyptus Globulus Leaf Extract, Adansonia Digitata Seed Extract, Selaginella Lepidophylla Extract, Adenium Obesum Leaf Extract, Beta-Glucan, Diamond (0.1 ppb), Rosa Canina Flower Oil, Ceramide NP, Squalene, Oryzanol, Fructan, Sodium Hyaluronate, Trehalose, Allantoin, Adenosine, Glyceryl Stearate, Polysorbate 60, Sorbitan Sesquioleate, Polymethylsilsesquioxane, Silica, Polysorbate 20, Xanthan Gum, Carbomer, Tromethamine , Synthetic Fluorphlogopite, Tin Oxide, Titanium Dioxide, Cetearyl Alcohol, Disodium EDTA, Ethylhexylglycerin, 1,2-Hexanediol, Phenoxyethanol, Fragrance. Michelle's Thoughts: Whoever said Diamonds are a girl's best friend was clearly right because the Diamond masks were my favorite out of the 3. I'm not sure if it's the slightly less thick serum or the diamond ingredient but these were the first masks out of the 3 that felt cooling and extra soothing on my skin. They have basically the same skincare benefits as the other 2 masks. So they are moisturizing, softening, provides a bit of dewyness, and suppleness. The Diamond masks also provided the best brightening effects as compared to the other 2 masks from the same line. However, I don't think the brightening effects are the best compared to some other brightening masks I've tried. My skin did feel refreshed after using these masks. Like the other masks, the nano fiber mask stayed on the skin nicely. The cut and fit were great too. Final Thoughts: These were some interesting masks and I'm glad I gave them a try. The nano fiber is definitely a unique mask technology and I really like it. I hope to try more masks with nano fiber materials. I was a bit disappointed by the ingredient lists, they are pretty much the same so all 3 masks provided the same benefits despite what they might claim. Still, I liked 2 of the 3 masks, so it's not a bad line. The price for these masks is a bit much and while I understand the nano fiber might be worth the extra $$, I don't think the mask serum is on par with it. Would I purchase these in the future? On 1 hand I want to because I liked the nano fiber masks. On the other hand I don't want to because the mask serums isn't the best I've seen and for the price, I could find better else where. I think if Bonvivant ever decides to reformulate the mask to give the mask serums an upgrade, I would gladly buy them to try. Do I think these masks are worth a try? Well, have you tried nano fiber masks yet? If not, I think these are worth a try because you might fall in love with the mask material like I did. However, I would suggest to get 1 or 2 first before buying more. Disclaimer: This product was send to me for review purposes. All opinions are honest and my own.